Thoughts for today …. #103!! The Lockheed Martin F-35 Lightning II is a family of single-seat, single-engine, all weather stealth multirole fighters undergoing testing and final development. The fifth generation combat aircraft is designed to perform ground attack, reconnaissance, and air defense missions. The F-35 has three main models: the F-35A conventional takeoff and landing (CTOL) variant, the F-35B short take-off and vertical-landing (STOVL) variant, and the F-35C carrier-based Catapult Assisted Take-Off Barrier Arrested Recovery (CATOBAR) variant. 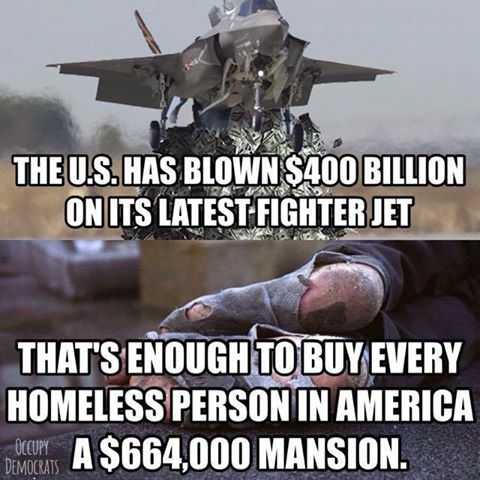 In February 2011, the Pentagon put a price of $207.6 million on each of the 32 aircraft to be acquired in FY2012, rising to $304.16 million ($9,732.8 million ÷ 32 aircraft) if its share of research, development, test and evaluation (RDT&E) spending is included.